Here is a case that appeared in the WBOC-TV 16. If you’re going to break into somebody’s house, steal three checks, then to pass them to the bank, here’s a tip: Don’t use your own driver’s license and Social Security card to prove your I.D. 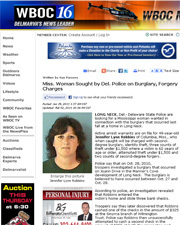 LONG NECK, Del.- Delaware State Police are looking for a Mississippi woman wanted in connection with the burglary that occurred at a home in Long Neck. Active arrest warrants are on file for Jennifer Lynn Robbins of Columbia, Miss., who when caught will be charged with second-degree burglary, identity theft, three counts of theft under $1,500 where a victim is 62 years of age or older, attempted theft under $1,500, and two counts of second-degree forgery. Police say that on Oct. 28, troopers investigated a burglary that occurred on Joann Drive in the Mariner’s Cove development of Long Neck. The burglary is believed to have occurred between Oct. 27 and Oct. 28. According to police, an investigation revealed that Robbins entered the victim’s home and stole three bank checks. Troopers say they later discovered that Robbins cashed one of the checks in the amount of $325 at the Smyrna branch of Wilmington Trust. Police say Robbins then unsuccessfully attempted to cash a second check in the amount of $955 at both the Harrington and Milford branches of Wilmington Trust. According to investigators, Robbins used her Mississippi driver’s license and Social Security card when attempting to cash the checks. This information assisted police in identifying Robbins as the suspect. Police are asking anyone who knows the whereabouts of Robbins to call investigators at (302)856-5850, ext. 221 or Crime Stoppers at 1-800-TIP-3333. Tips may also be submitted online at www.tipsubmit.com.